A new super-hard hub specially produced for Unicycle.com, with super-wide flange spacings for a super-strong wheel. Center Flange to center flange distance is 100mm. Flange OD is 56mm. Flange width is 3mm. Overall width, end-to-end is 180mm. Spoke holes are for 14 gauge spokes not 12 gauge spoke (Coker spokes). Can be drilled to fit 12 gauge spokes. The measurement from outside bearing to outside bearing is 140mm. 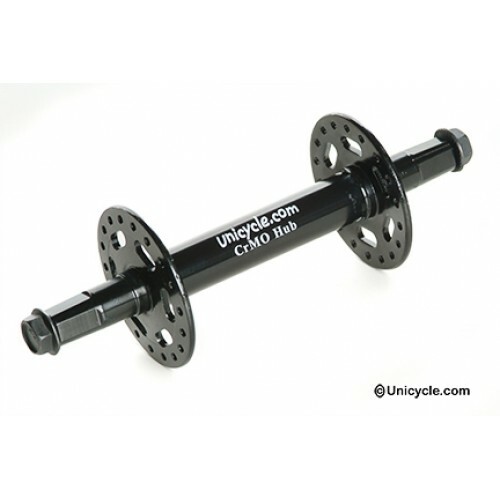 Note: This hub utilizes 40mm bearings, and is compatible with 40mm frame/bearing housings. The wider the space between flanges, the stronger the wheel. These flanges are spaced farther apart than any other hub currently in production. Compatible with Coker unicycle frames only. Includes a pair of high tensile-strength bolts and 17 x 40-mm double-seal bearings. The measurement from outside bearing to outside bearing is 140mm.